Carolyn has been composting for around 18 months now. She got started with composting because she was worried about the amount of rubbish in her bin and was keen to do her bit for the environment in as many ways as possible. She said: “I knew that composting was a good way of reducing the amount of rubbish I was throwing away and it just went from there”. So, how does it work on a practical level? Carolyn explained: “I keep kitchen scraps in a lidded, filtered tub. I use compostable liners to keep the mess down. I compost only raw vegetable and fruit remains. I put in torn paper and toilet paper and kitchen roll tubes from time to time. I also put tea bags and tea leaves in. Around once a week I empty my tub into the compost bin. I empty compost out of the bin every six months or so." If you live alone why not, like Carolyn, share composting with a neighbour or two? 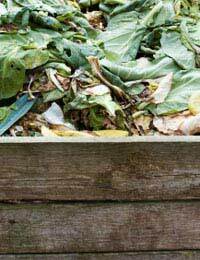 Before you spend money on a composting bin, ask your council what they can offer. Like Carolyn’s local council, they may offer a deal or discount to encourage composting. As Carolyn did, research composting online and see what information your local council offers. Experienced composters will usually be more than happy to help. If you’re worried about mess from composting, investigate the products which are on the market to help you compost without mess and fuss. For example, Carolyn used a special lidded, filtered tub and compostable liners – both these products are available in high street shops.